Oh, what to do? Since starting ArtKritique I've wrestled with what to do when I come across truly bad art, should one just ignore it like a one would a bratty and attention seeking child? After all the characteristics are often the same so surely the logic follows that, properly ignored, it ought to go away. But of course it never goes away, some perverse family circle encourages it ever more, teachers smile approvingly, its told that it's big and clever and its rewarded for its persistent repetition. And that's the problem. Bad art, dumb art with delusions of intellect, single-idea-no-talent art is nurtured by a whole promotional and curatorial eco-system that has a vested interest in the Emperor believing his suit is just dandy. That bugs me. On a grey day off when I wandered upon the day-glo installation of Joan Ross's 'Enter At Your Own Risk' at Gallery Barry Keldoulis all of my buttons were pressed at once. Here was a work (works?) that delivered the full checklist of dumb art cliches: the mistaking of clumsy oxymorons for complexity, the equation of ugliness with aesthetic challenge and the complete misapprehension that such institutionally nourished work represents any kind of threat. 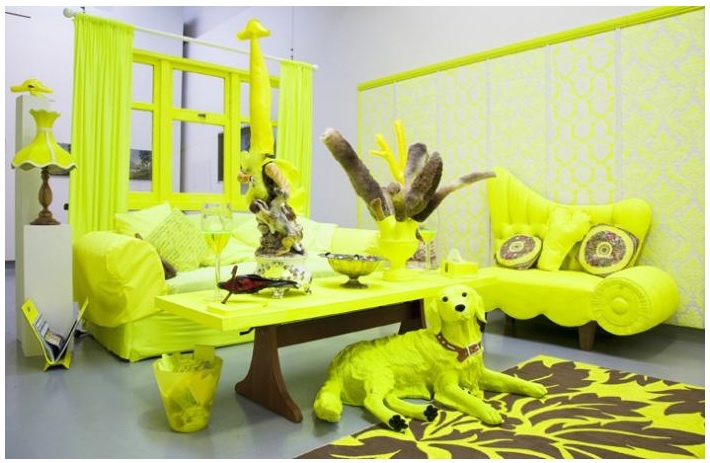 The best way to describe the installation, housed in a white warehouse space, is as a recreation of the contents of a particular type of Australia home, perhaps lower middle class, perhaps still anchored in the Fifties. 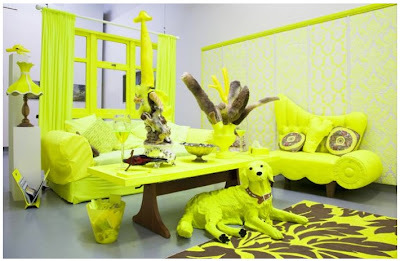 Every element, and there are a lot of elements, has been rendered in a high visibility day-glo yellow. The decorations are heavy on the heavy handed Australian Colonial iconography, native fora, shocks of animal pelt and doctored period landscapes. It's as though we're looking at Colonial Australia through the nostalgic lens of Nineteen Fifties (or perhaps, Sixties or Seventies) Australia and the post-modern day-glo aesthetic of the Eighties. The rather confused message seems to be something like 'something that was kitsch is now even more kitsch', it's hard to say really but you do sense that there is something portentous afoot, there always is when colonialism is invoked. 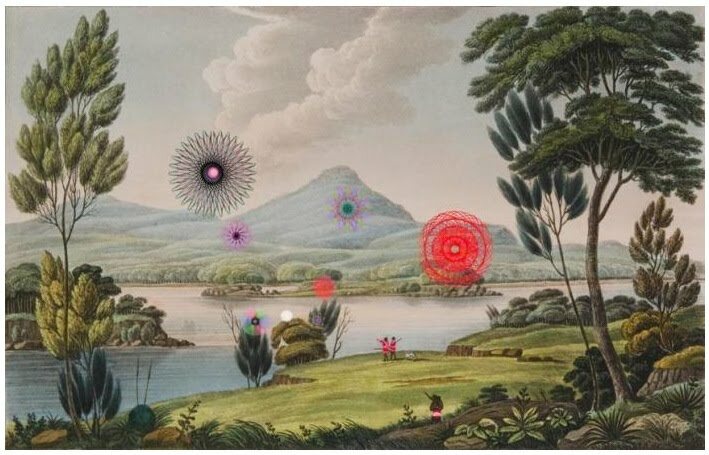 The problem here is that the artist appears to mistake a series of truisms, 'the representation of early colonial Australia was ideologically determined' or 'Fifties Australia is all a bit embarrassing to us now' and mistakes them for profundity. If these were more insightful they wold create some kind of tension, but there's a palpable absence of that kind of dialectic. Which probably explains why everything is painted bright yellow. Or not. This highlights a problem with much conceptual art. 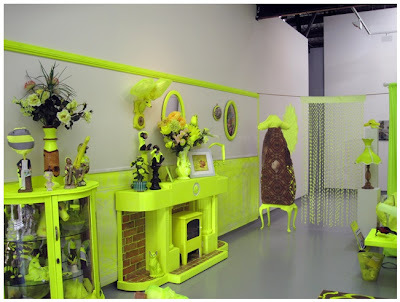 Shock value or novelty (here recreating a room and making all its components day-glo yellow) is the dominant currency for a certain kind of contemporary artist and it's really easy to see how works like this begin with the question "What would be really different?" Novelty in itself is not offensive, however for conceptual art to work it first demands some kind of intellectual rigour or complexity. Simply picking up some familiar old art theory assumptions, which have the aura of rigour because they once originated in academia is not the same. It's stupid and lazy and all a bit pointless. But there you have it. A lot of art, art like this, is stuck in a self-serving vortex of novelty and self-congratulation that's been polished up with hints of old cultural studies debates. Perhaps we can just ignore it and it will go away. Otherwise we can just take the piss out of it, not part with our money and hope that it will go home and have a long hard think about just how silly it's been. An awesome and pinpoint-accurate assessment of what is wrong with contemporary art in this country- and doesn't shy away from putting the blame squarely where it belongs. A great many curators should be whacked across the snout with a hard copy of this post!